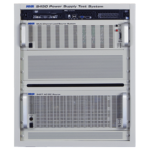 This group of automatic test equipment (ATE) consists of: Modular Test System (S400), Functional Test System (S450), Multi Channel Power Supply Tester (S600), Universal UPS Test System (5500), Universal Test System (5600), and the Engineering Characterization Test System (5700), & provide complete test solutions for the functional testing of DC power supplies, UPS and related power conversion components. Applications include high volume production testing, Engineering Design Characterization (5700), incoming inspection and depot repair. Systems are based on industry standard software and hardware architectures and are configurable from small benchtop to multibay units. NH Research, Inc. (NHR) is a leading supplier with well over 1000 systems installed worldwide. Fundamental to the success of all products is the total commitment to customer support. NHR is fully staffed with the technical expertise, diagnostic tools and replacement parts to resolve problems rapidly whatever the cause. This support system includes knowledgeable application engineers, a worldwide network of field engineers, factory training programs, test program developers, calibration services, telephonic and, on-line support.